Last Tuesday we had the pleasure of hosting the Winter Lecture Series 2014 with Maria Sisternas, as well as some important guests attending the lecture such as Mr Antoni Vives – Deputy Mayor for the Urban Habitat of the Barcelona City Council – and Mr. Vicente Guallart – Chief Architect of the Barcelona City Council. During her lecture Ms. Sisternas discussed City planning through the Case Study of one particular project: the area of Glories, here in Barcelona. In this sense, the management of these processes, and how they can pass from rigid designs, as in the past, to a more flexible situation, in the hope of satisfying the contemporary urban phenomenon’s needs, from social, economic and environmental points of view. Ms Sisternas presented the project through 10 paradigms of change. 1_ The city as an incremental process: how can the city manage and participate actively during the construction site time lapse, through the generation of positive dynamics, as well as continuous activity? In large scale urban transformations, the areas involved tend to loose economic activity and density, generating a high risk, particularly in the case of Glories where the City’s aim is to create a new centrality. How can the complexity involved, on all fronts and in all phases, in these processes guarantee positive outcomes, particularly in the public realm? More simply, why is it that some public spaces work and others don’t? 2_Moving from designing for the people, to designing with the people: The first interest in the development of large scale urban transformations is now to understand what the citizens expect form said transformations. This information is then obviously discussed from a political point of view, as these clearly represent an important public investment. 3_From an infrastructural approach to the Human scale: the particular situation of glories, was that of a mega infrastructural node. How can this become a new centrality for the people? How can this image be changed? 4_Longterm previsions vs the relationship with the everyday lives of the citizens: the City Council has decided to activate the construction site through social micro colonisation. It is a meeting point of diverse ecosystems. Through the progressive reactivation thanks to micro investments, first the border spaces, then towards the more central spaces, the construction site becomes a dynamic centre for activities, already changing its image in the mmd of its potential users during the construction process. 5_From a more closed and designed system to a more open, temporary and ephemeral situation. 6_Sustainability and ecological compensation: How can we compensate the ecological footprint of this area? The concept applied was that of proposing architecture generated through the development of green infrastructure. 7_From intuition to facts: The design an no longer be based on suppositions, the project is finally shaped through the data available. 8_From impersonal to tailored solutions: this point is in particular reference to the housing and residential development of this project. 9_From underused facilities to Vibrant buildings: reactivating the area calls for a dynamic use and participation. 10_From overdetermination to a continuous process: developed thanks to the innovation of materials, knowledge and information, generating a positive outcome in the spatial distribution of the final project. Finally the 3 main objectives of the project can be summed up into: a current and future economic, environmental and socially friendly process, the consideration of the everyday life of the users from the beginning of the process into the future, and the generation of an open and flexible situation towards the generation of a new urban centre. Maria Sisternas trained as an architect at EtsaB-UPC, was awarded with the Fundación Caja Madrid Scholarship and holds a MSc in City Design and Social Sciences from the London School of Economic. She has lectured at the Postgraduate Diploma in Sustainable Architecture and Urbanism at La Salle (PAMUS) since 2010 and serves as a Board member of COAC. She is a regular contributor to the “Resvista Diagonal” and took part of the Commission of Architecture at the Barcelona Metropolitan Strategic Plan 2010-2020. Her interests focus on the links between the economic, social and legal issues that contribute to the development of contemporary cities, as well as the influence that urban form can play over citizens’ quality of life. 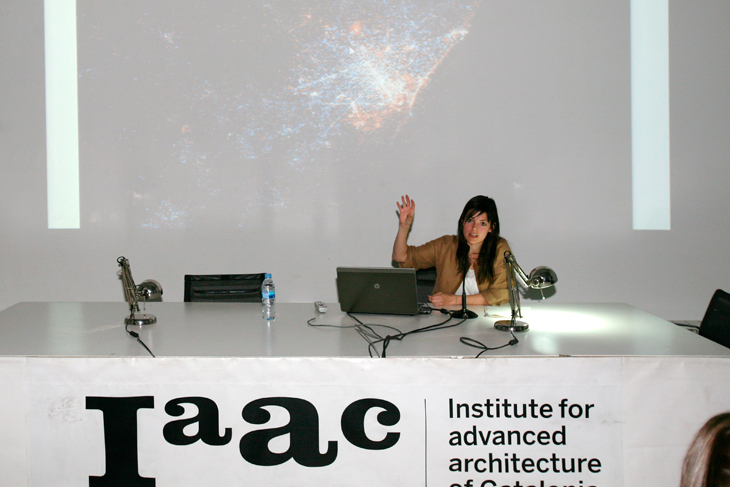 She is currently Director Projects at the Urban Habitat Department of the Barcelona City Council.